So far, in my research, I’ve found this one from One Step Ahead. 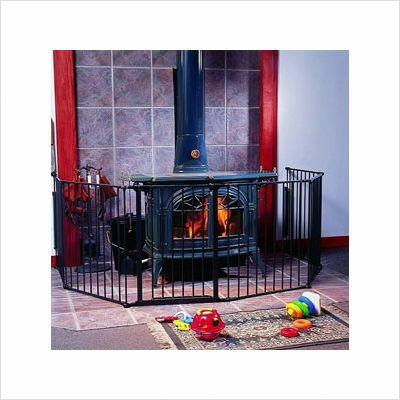 To have it big enough to fit around our wood stove, it would end up costing about $240. This one would be about $221…we narrowly missed one of these on Craigslist for $120. We’ll keep watching on Craigslist, I guess, but we may have to resort to buying new since this is something we need to take care of soon, with it getting colder, and we aren’t lighting that wood stove with Katie running around until it’s gated off! 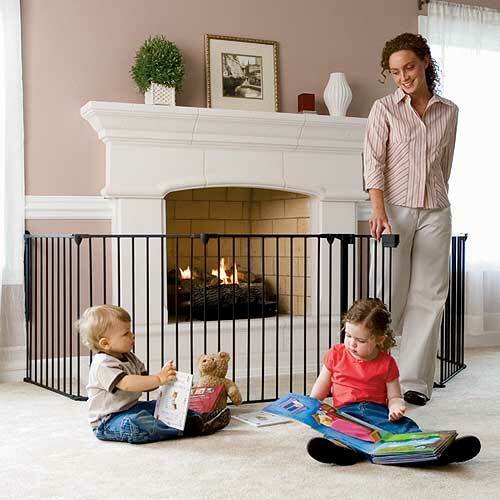 How do you deal with a fireplace or wood stove and little people? What have you used to keep your kids safe? Leah & Birken trained Polly to stay on the carpet at their house (she does it at any other house, too). Result: she stays away from the stove and out from underfoot in the kitchen, as well. Tripping over a toddler while you're making dinner is no picnic, either. Last winter I was VERY preggo and my toddler was 19months, she's pretty good st minding (then not now- haha) and we just watched her and made sure she knew the fireplace, space heater, and stove were 'very hot and could hurt her' and we never had a problem. we would take her and sit with her very near the FP so she could feel the heat come off of it and also so she 'knew' about it and wasn't curious enough to disobey. good luck! We have a woodstove and bought the fireplace gate. Don't take the risk, esp. with a little one and a newborn. I'm not being preachy, just honest. My kids are 25 and 23 months apart- we use a woodstove to heat our house. My oldest is 5. When kids are playing they can't always remember to watch out for stuff- for us its too great a risk. That gate is ugly and it takes up half our living room. But its also kept my kids safe and I can sit and nurse the baby without fear. One Step Ahead is where I got ours, and I used their monthly birthday coupon code plus ebates, which saved 15% and then 7?? % cashback. Remember, too, that this will hold its value, so when your kids are bigger, you can sell it and recoup some of the cost. I've had way better luck posting that I'm LOOKING for things on Craigslist than trying to sell or answer ads. Oh, and I'm following back from the Saturday hop. The gate is probably going to be your best bet. It will be such a pain when you need to put wood on the fire but at least the little ones won't get burned. I am a new follower, I would appreciate it if you could stop over and possibly return the favor. I am giving a Mrs. Santa Claus Apron away to one of my followers 12/5. Hi I'm your newest follower from the blog hop. I'd love for you to return the follow. When my DD1 was a baby, we had a house with a fireplace. What we used we actually had bought for a puppy we had at one time. It was a "puppy play pen" sort of thing. I think it had 6 panels that you could use to create a pen for puppies to be contained in. We were able to set it up around the fireplace in the same manner as the pictures you posted. I liked the fact that it wasn't permanently attached to anything. Previous post: Sunday Blog Hops!